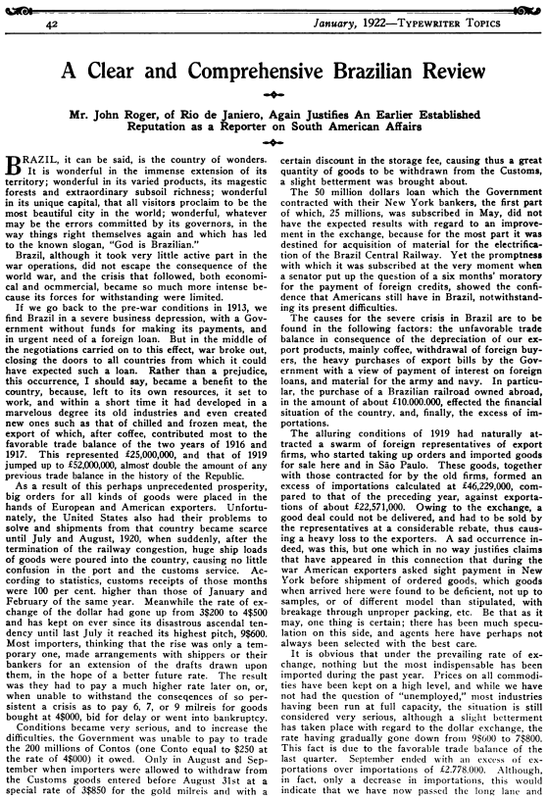 oz.Typewriter: The Full Brazilian Typewriter: Let's Cut to the Chase Here, and not Wax Lyrical - Was he Avezedo or Azevedo? 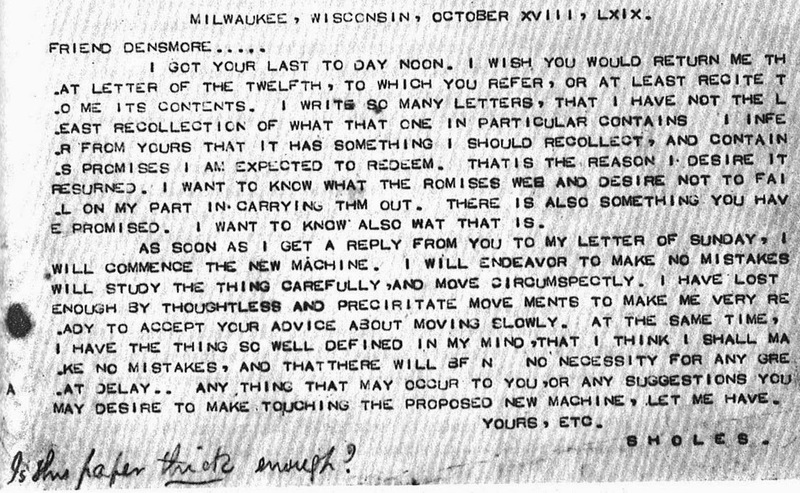 The Full Brazilian Typewriter: Let's Cut to the Chase Here, and not Wax Lyrical - Was he Avezedo or Azevedo? 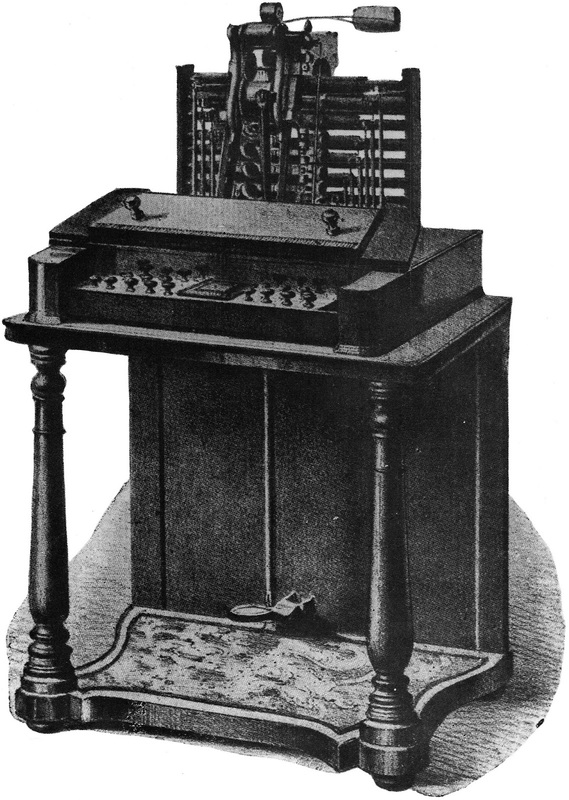 Avezedo's typewriter. Or is it Azevedo's? Goodness, I wish I was in Brazil right now, instead of Siberian Canberra. Now, before I go any further with this post, is Avezedo considered to be the same surname as Azevedo? I ask because I simply don't know, and can't find out with any degree of certainty. Azevedo is a very common surname in the Portuguese language, but I have also seen many references to Avezedo (including a saint) - though online searches for Avezedo do automatically switch to Azevedo. 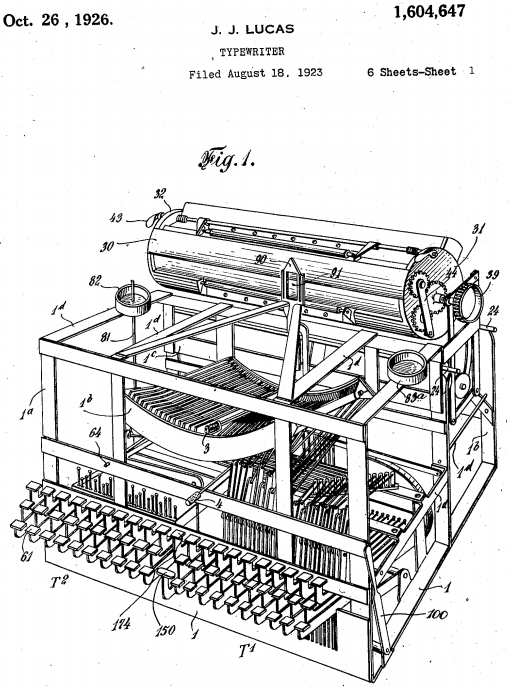 The reason I ask is that English- and German-language typewriter histories (1923-1973) list the Brazilian inventor as Avezedo, while later historians (1997 onwards) refer to him as Azevedo. Indeed, Michael Adler changed his mind between editions (1973 and 1997). So which is it, or does it make no difference? I'd like to know before I start compiling my Dictionary of Biography of Typewriter Inventors, not that the correct spelling will change the padre's position in the listings. I've naturally been thinking Brazil these past few weeks, because of a certain World Cup finals tournament being played there in one of the lesser football codes. Happily, Brazil will get the see more of the real, original thing in 2016, when rugby union (in sevens form) returns to the Olympic Games (with the United States as defending champions, having won in Antwerp in 1920 and Paris in 1924). 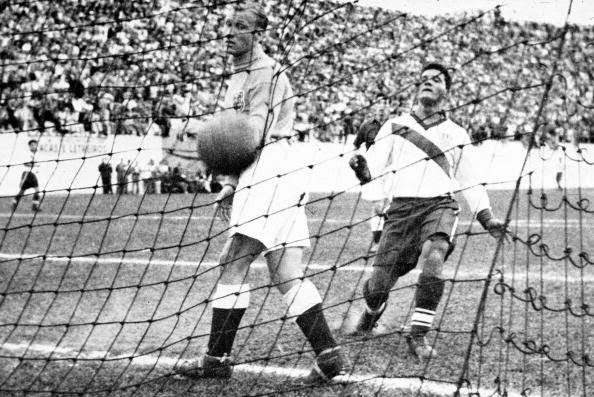 Did you know that when Brazil hosted the 1950 World Cup soccer finals, England made its first appearance and was beaten by the US? Joe Gaetjens scores for the US against England at Belo Horizonte (where this year's hosts Brazil have just knocked out Chile on a penalty shoot-out) on June 29, 1950, 64 years ago tomorrow. Only ONE typewriter in sight, a Hermes Baby on the lap of the gentleman in the middle. 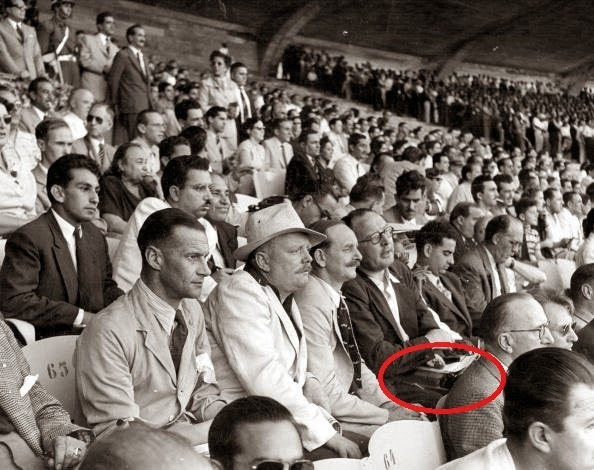 This is the Press Corps covering the opening match of the 1950 tournament, Brazil versus Mexico. 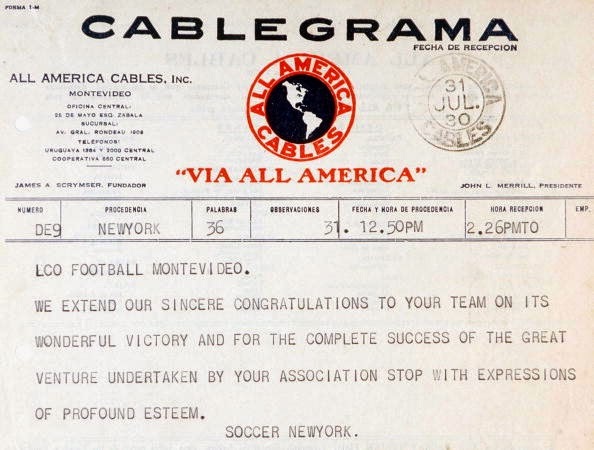 As for this other football event, the one being played right now, it's good to see that many of the typewriter-producing countries of the world have qualified for the round of 16 - the United States, Germany, host nation Brazil, Mexico*, the Netherlands, France and Belgium. And of course, to mark the week of Georg Sommeregger's birthday, good old Switzerland (very impressed by them, Georg). 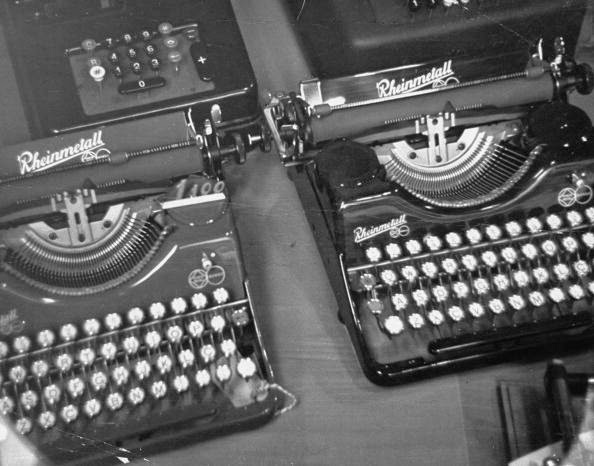 Those typewriter producers which failed to advance included Japan, Italy, England, Portugal, Spain and Russia. *I have a post coming up on a very interesting typewriter made in Mexico. 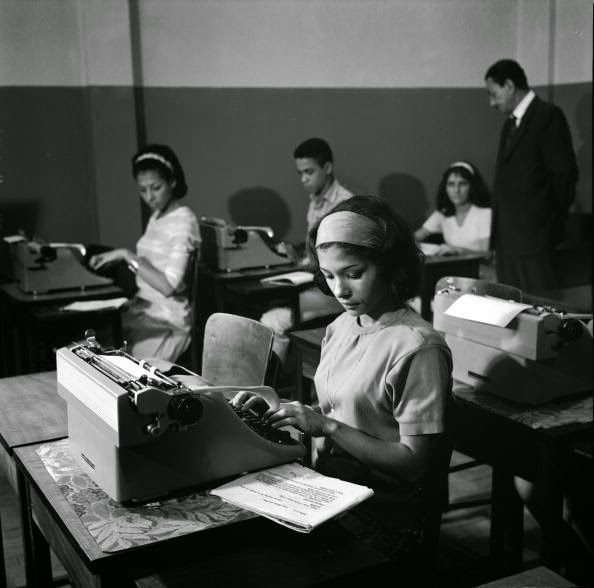 Olivettis being used in typewriter classes in Brazil in 1950, the year Brazil last hosted the World Cup soccer finals. Typing college graduates in Brazil in 1938, the year France hosted the World Cup soccer finals. Brazilian poet Manuel Carneiro de Sousa Bandeira Filho (1886-1968) at his Royal portable typewriter in 1943. 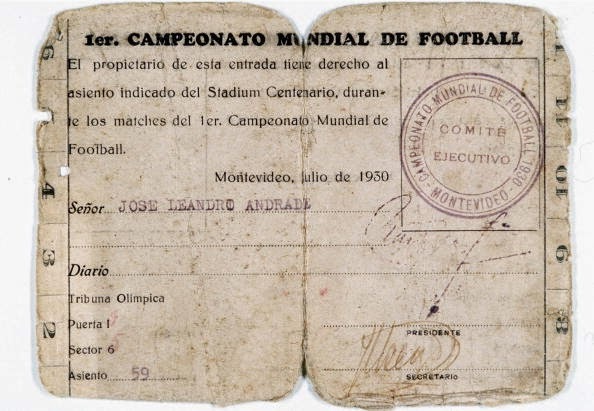 Typewritten mementos from the first World Cup, held in Uruguay in 1930. 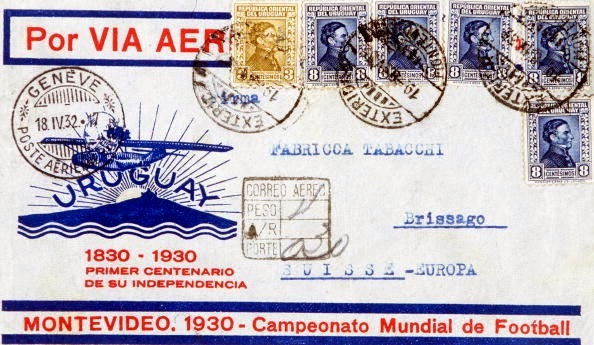 Unfortunately, Uruguay have had the bite put on them this time, and they were looking good, too. OK, enough of all this sporting nonsense. Down to typewriters, and Avezedo (above), or is it Azevedo? 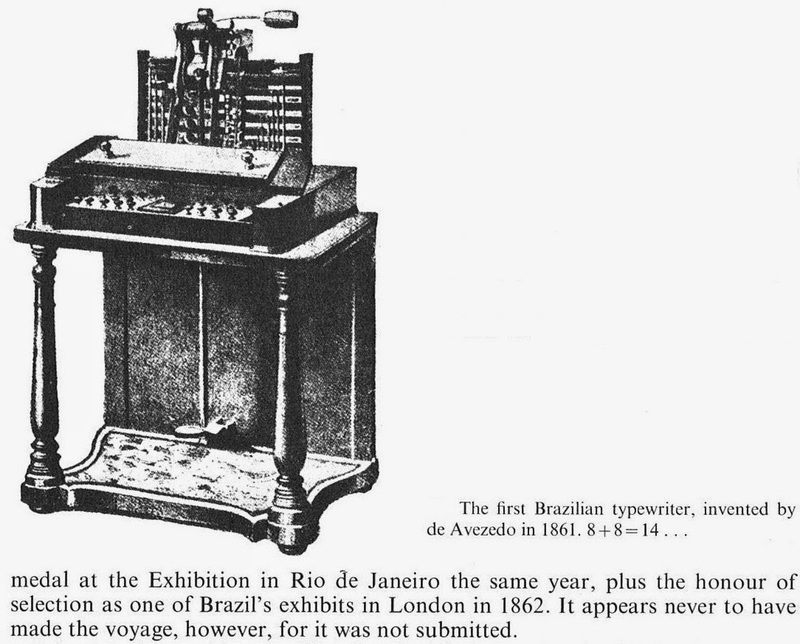 In 1923, Typewriter Topics said Avezedo - it's the first reference in a typewriter history to the Brazilian. 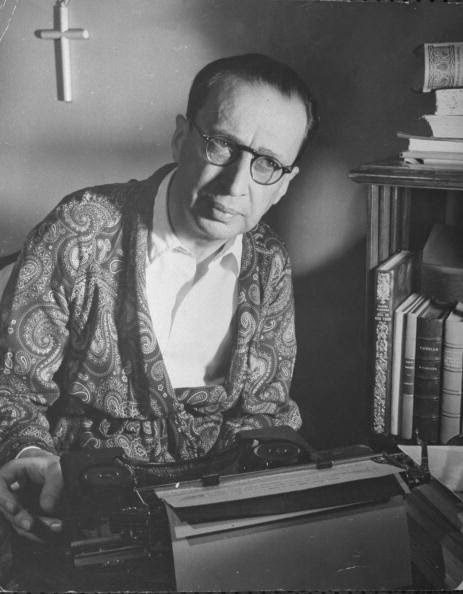 In 1949, Ernst Martin agreed. And in 1973, so did Adler, in The Writing Machine. There are many references to Avezedo (all as Azevedo) in Portuguese-language websites. The enduring Brazilian claim that Christopher Latham Sholes was a "thief" who stole Avezedo's typewriter - oh so persistently raised in these references - is, of course, just arrant nonsense. 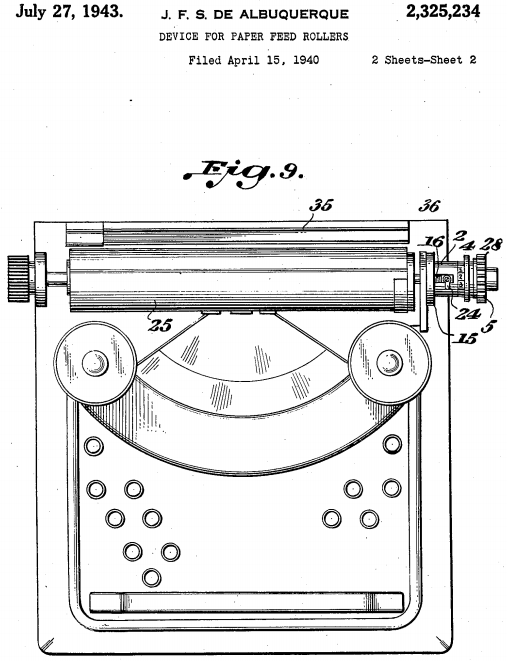 One entry states, "1873 - Theft of the typewriter, by a foreign (probably Christopher Latham Sholes)." Still, I'm one of those pedants who believes that if we mention Avezedo at all, we should be consistent with the spelling of his name. Can anyone settle this? 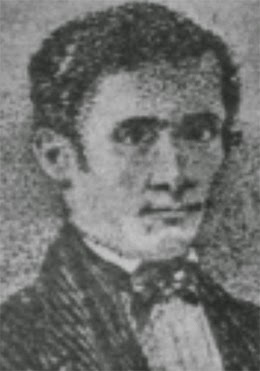 Avezedo was born in Paraíba do Norte (today João Pessoa) on March 4, 1814. He attended Olinda Seminary from 1835 and was ordained a priest in 1838 in Recife, where he taught technical courses in geometry and mechanical drawing. 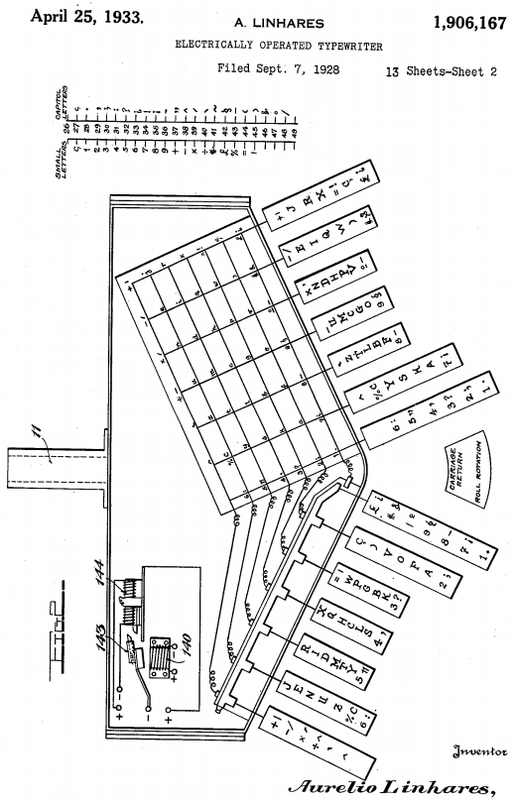 He returned to Paraíba in 1863 and in 1868 became professor of mathematics and geometry in the college of arts attached to the Faculty of Law of Recife. 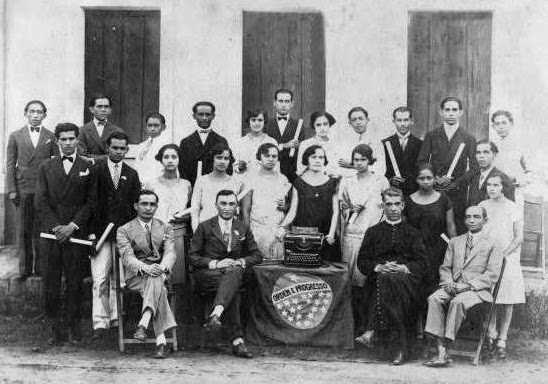 On November 16, 1871, Avezedo became an honorary member of the Institute of History and Philosophy of Pernambuco, and on January 31, 1872, he became professor of the Mechanical Society of Artists and Liberals. Avezedo died in Paraíba on July 26, 1880. His typewriter was presented at the Agricultural and Industrial Exhibition of Pernambuco in 1861 and the National Exhibition in Rio de Janeiro at the end of that same year, being awarded one of nine gold medals in the presence of Emperor Pedro II on March 14, 1862. It wasn't taken to the London exhibition because of a shortage of space in the Brazilian pavilion. 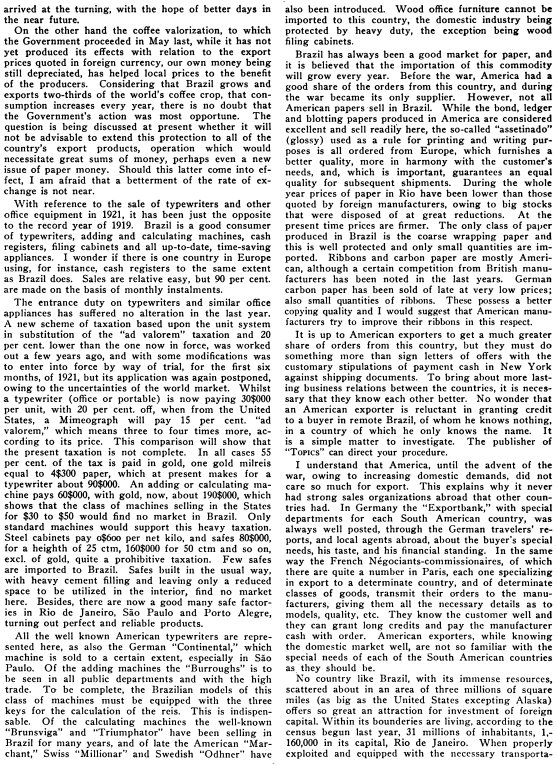 One Brazilian historian wrote, "In vain they seek is the name of Francisco João de Azevedo in the history of writing written by a foreign machine". No wonder, if it is spelled Avezedo, not Azevedo!